When was the last time you stepped into a phone booth? If you’re under 30, you might not even be aware that phone booths used to be on nearly every street corner as a means to contact your parents after the football game or call a taxi after dinner. Of course, there are those scenes from the original Superman that might jog your memory. Once cell phones became mainstream, the empty phone booths became easy fodder for graffiti, pollution and public urinal use. 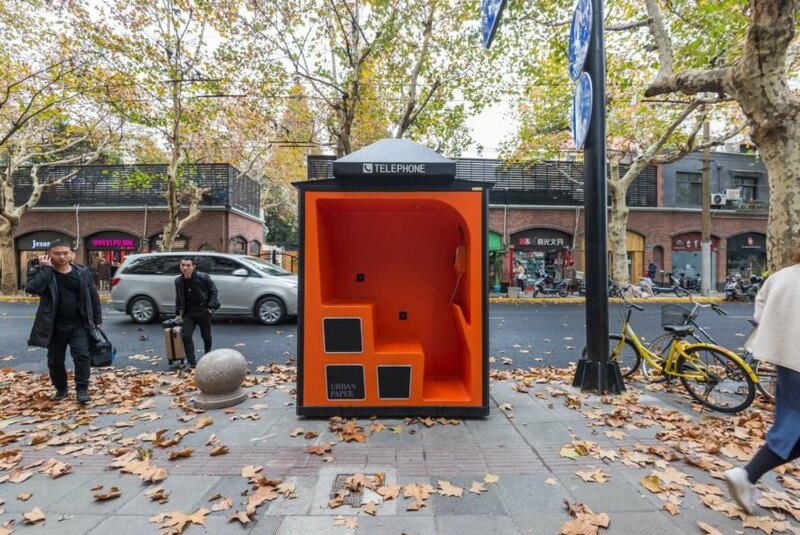 But while the era of the phone booth is long gone, in Shanghai, these relics are being upcycled into useful curbside furniture. 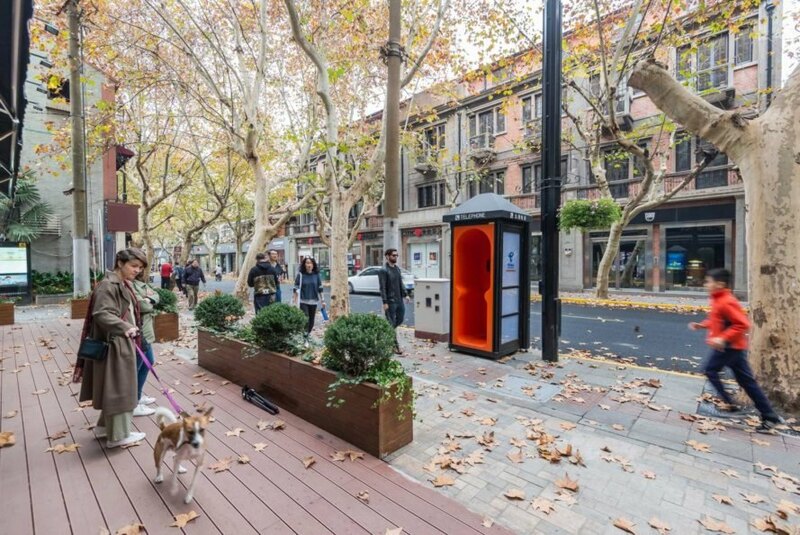 Many cities in China, like most major metropolitan areas, have grown beyond the need for public phone booths, but the government decided to transform the existing architecture into something more appealing. 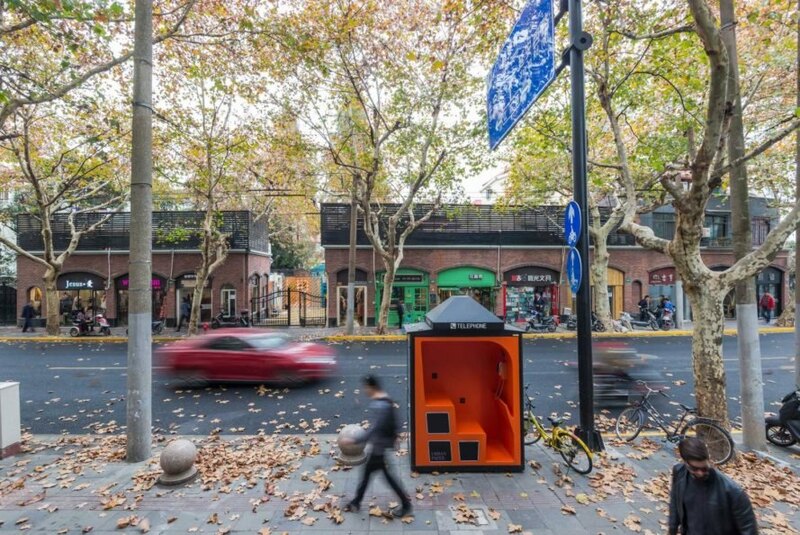 As contracted by the government, Shanghai firm 100architects took on the challenge of finding a new use for the phone booths on Yuyuan Road, a historic road in the city. The goal was not only to find another use for the phone booths but to make sure the new design was useful and accessible to the public. While the outside looks like what we remember as a traditional phone booth, the standout orange interior provides shelter and a spot to hang out. Depending on the size of the unit, some have tables while others are standing-room only. One thing they all have in common is a side that is open to the sidewalk and passersby. This is an intentional effort to encourage engagement in a population that has become solitary thanks to individual cell phones. 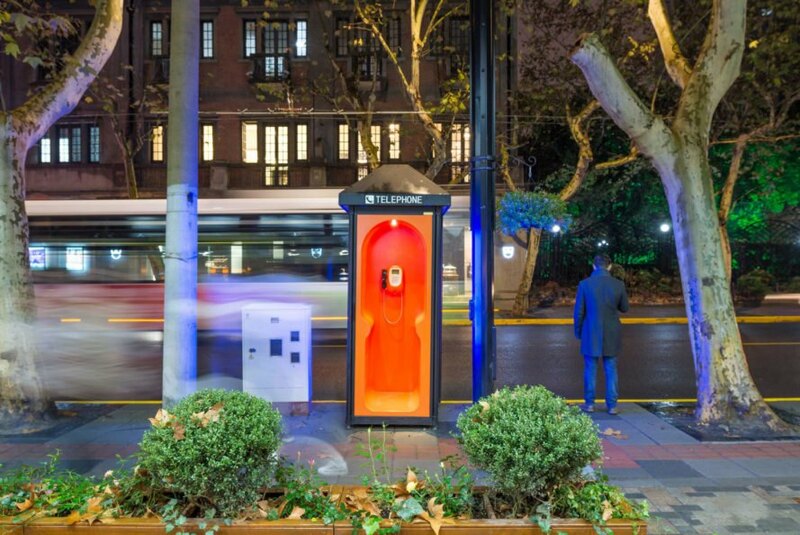 All three “Orange Phone Booth” prototypes include LED lighting that illuminates the structures after dark. They also include a free Wi-Fi connection and USB charging sockets, which are a popular draw for many people on the go or with time to kill. You might also find a newspaper rack, reading lights and an emergency public phone. 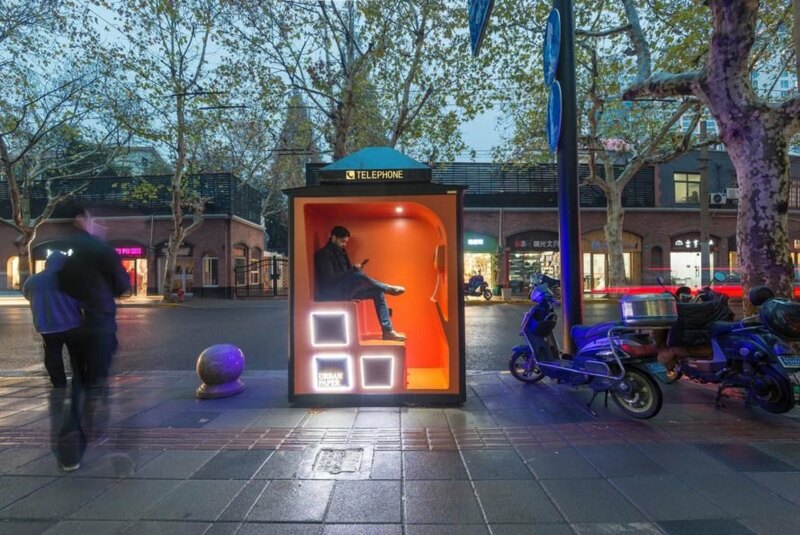 There are currently five renovated phone booths along Yuyuan Road that work equally as public furniture and statement pieces. In recent history, phone booths were ubiquitous. But with a rise in cell phones, they've become dated and disused. 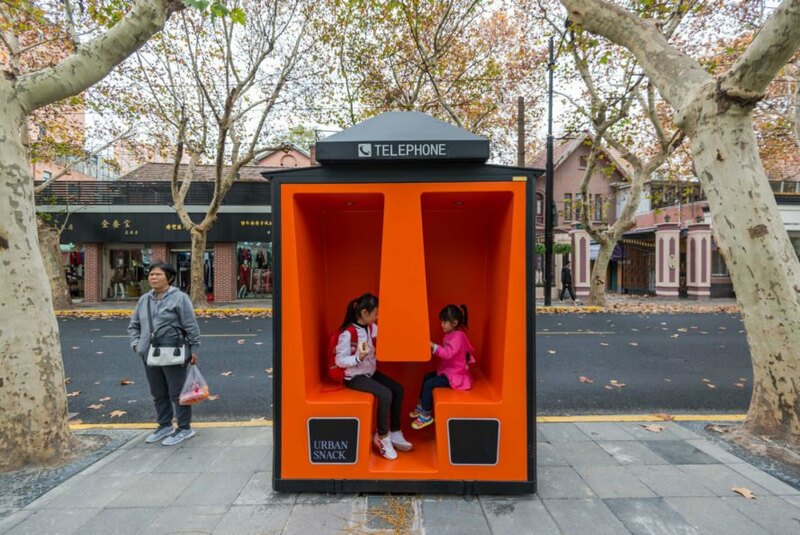 Commissioned by the government, Shanghai-based firm 100architects has upcycled old phone booths into outstanding and useful community centers. The hubs look like a typical phone booth from three sides, but inside, they feature bold color and high-tech resources. The booths vary in size, with some having only enough room to stand. Other booths feature benches or tables. Every booth is equipped with free Wi-Fi and USB charging sockets, while some have newspaper racks, reading lights or emergency phones. There are currently five of the updated booths in operation along the historic Yuyuan Road.